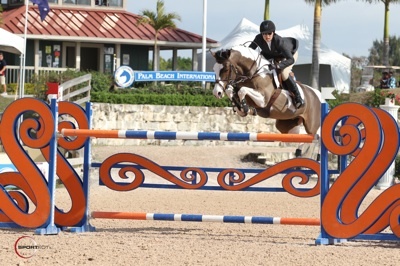 Brianne Goutal and Mon Gamin won the $6,000 Spy Coast Farm 1.40m Speed Challenge during the second week of the 2011 FTI Winter Equestrian Festival. Photo © Sportfot, Official Sport Photographer of the FTI Winter Equestrian Festival, www.sportfot.com. Wellington, FL - January 21, 2011 - After showing together for nine years, the partnership between Brianne Goutal (New York, NY) and her pinto Mon Gamin makes winning easy. They sped to the top of the class in today's $6,000 Spy Coast Farm 1.40m Speed Challenge. The second week of the FTI WEF continues through Sunday, January 23. The 2011 FTI Winter Equestrian Festival has 12 weeks of competition through April 3, 2011, and they will be awarding more than $6 million in prize money through the circuit. The highlight jumper class is Saturday night's $40,000 Equine Couture/Tuff Rider Grand Prix, CSI 2* at 7 p.m. This week's course designer in the International Arena is Luc Musette of Belgium. There were 39 entries in today's Time First Round class, and eight of those were clear. The fastest was Goutal on Mon Gamin, owned by Cloverleaf Farm, who stopped the timers in 64.769 seconds. Goutal said of the course, "It was great for me. I was able to gallop in places. I was a little slow for the first four jumps. I couldn't really get him going. There was an inside turn to number five. I didn't do the inside turn, I just galloped around the turn. After I galloped around the turn, he was open. Then he was flying everywhere. It was a great speed course; there were places you had to turn, places you had to gallop, and lines that tested your rideability. I was really happy with the course." Yann Candele (CAN) rode Carolla Z for owner Liz Currie to second place in a time of 65.100 seconds. Laura Kraut (USA), on Pin Oak Farm's Winde, was third in 67.238 seconds. Goutal and Mon Gamin have been consistently winning speed classes since they started showing together nine years ago. "Since the day we got him, he's been competitive," Goutal confirmed. "He's a real winner. He goes in every time more careful than the last, which is why we move back down a class every time we show him. I think he's found a niche as a speed horse, especially with me. I know him so well and he knows me. He's a really happy horse and we try and keep it that way." Goutal, who is 22 years old, first saw Mon Gamin in France when she participated in a two-week clinic with French Olympic show jumper Thierry Pommel. Mon Gamin, who was bred in Spain, is a 15-year-old KWPN gelding by Libero x Shogun. She recalled, "There were three horses: a black one, a white one, and a pinto. He was a six-year-old stallion. He was so cute!" "I don't know if I thought he was amazing or just cute. I had to have him. I had a dream about him and I convinced my dad that it was fate. It was destiny!" she laughed. "I ended up with a pinto and we gelded him because he was wild. But he's been perfect ever since." Goutal said that Mon Gamin has settled into his "routine" here at the FTI WEF. "This is his eighth Florida with me and he's been in this routine for the past three years," she noted. "He does a trail ride on Tuesday, light flat on Wednesday, a schooling class on Thursday, his 1.40m on Friday, and then a day off and then flatting. He's the best; he lives the life!" Tomorrow night at the 2011 FTI Winter Equestrian Festival will be the first Saturday Night Lights event of the season. The $40,000 Equine Couture/Tuff Rider Grand Prix will begin at 7 p.m. in the International Arena. Don't forget to pick up your tickets for tomorrow night's exhibitor party at the exhibitor services office, or at the stabling office! The party will be held at the White Horse Tavern from 5 to 7 p.m., prior to the $40,000 Equine Couture/Tuff Rider Grand Prix.